When shopping for wine I tend to just buy whatever random bottles I see that I haven't tried yet. No real rhyme or reason. Does it look interesting? Great, I buy it. Does it look weird? I buy it. Do I have difficulty pronouncing the name? Buy it. Is there liquid inside? Buy it. But sometimes, I do actually go with others' recommendations. Such is the case here. 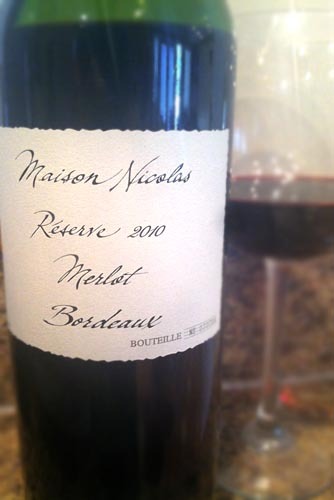 This is the 2010 Maison Nicolas Merlot Reserve from the Bordeaux Region of France. It was recommended to me by the same people at my local wine/beer cellar who talked me into buying a bottle of Tanilla Porter, granted this purchase was considerably more favorable. Anyway, this is a relatively cheap French wine. But price can be deceiving. So let's cut to the chase. The 2010 Maison Nicolas Merlot Reserve pours a dark, semi-hazy garnet and shares aromas of plums, prunes, cherries, and strawberries. Tasting brings dried strawberries, cherries, and cranberries blending into notes of stone, a fair bit of pepper, damp earth, and bitter oak in the finish with a good, chewy mouthfeel from the moderately strong tannins. In some ways, this almost tastes like a Merlot mixed with a California Zinfandel. It's an interesting and intriguing wine, and quite honestly the best Merlot I've had this entire year. And that's saying something, especially since it only costs around $8-12 depending on where you find it. The price is deceptively cheap for how tasty this wine is. I could pair this with game meat several times a week and be a happy, happy guy. Drink This: if you want a great bang-for-your-buck French Merlot.